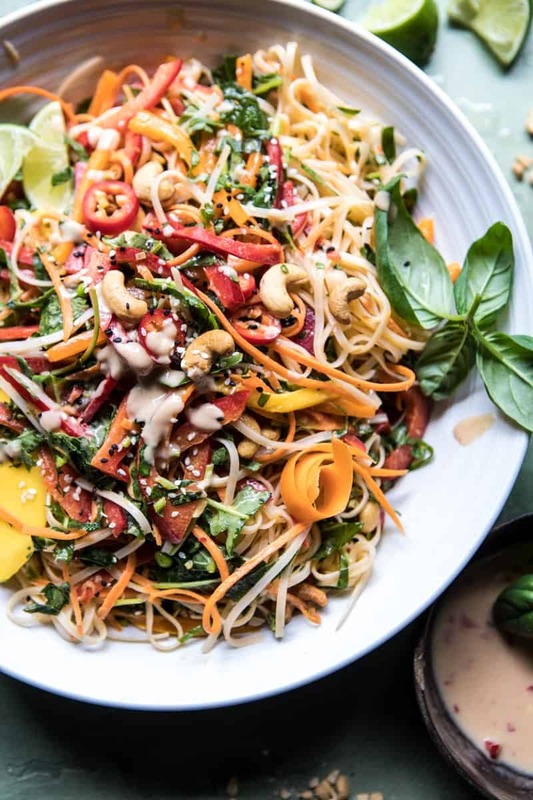 Rainbow Thai Basil Noodle Salad with Sesame Vinaigrette. 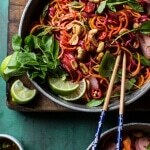 Hey, hey, to colorful summer salads!! When it comes to making a great salad you guys all know that I love them hardy and loaded! 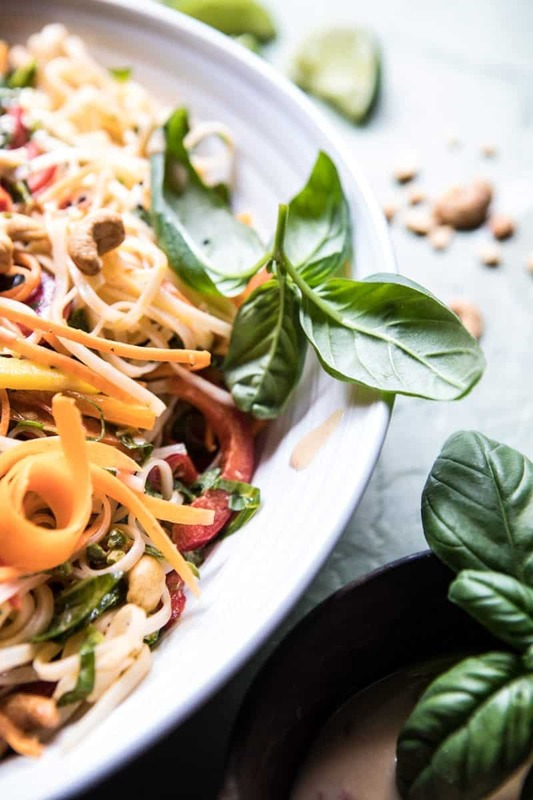 So I’m sure it comes as no surprise that a noodle salad is totally my thing. 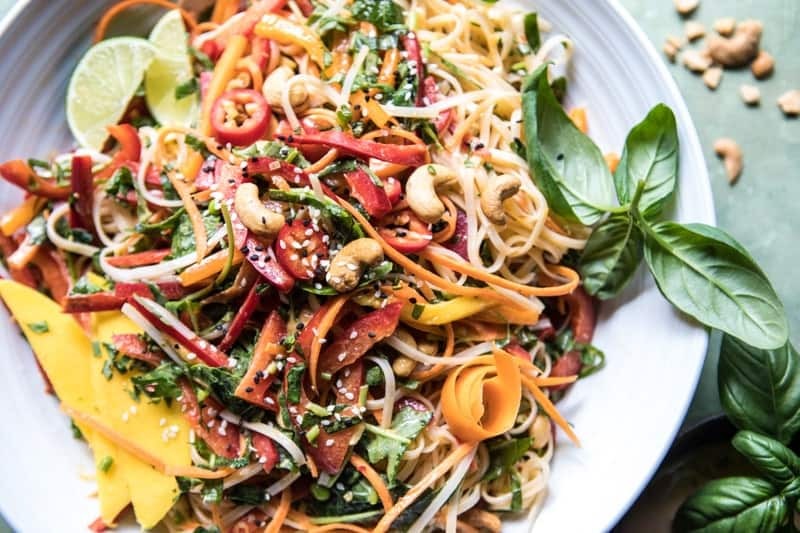 Especially when it’s a Thai noodle salad. I’ve been on a huge Thai food kick and I don’t see it going away any time soon. This salad is perfect for the summer, and has been a weekly favorite around here since the start of June. It is SO GOOD!!! 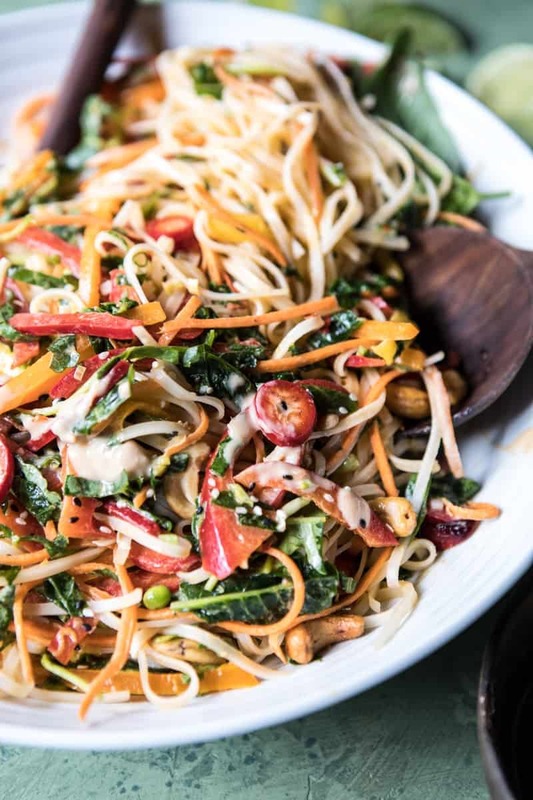 The secret to this noodle salad is the spicy sesame vinaigrette. I used Kroger brand, Simple Truth Organic Tahini, as my base. I then added honey, fish sauce (I promise this is good, don’t be afraid of the fish sauce! ), ginger, garlic, and a fresno chile pepper. It’s addictingly good! I like to use any leftovers for dipping veggies into as a healthy snack! If you’re not familiar with tahini, it’s sesame paste or butter…think peanut butter with sesame seeds. 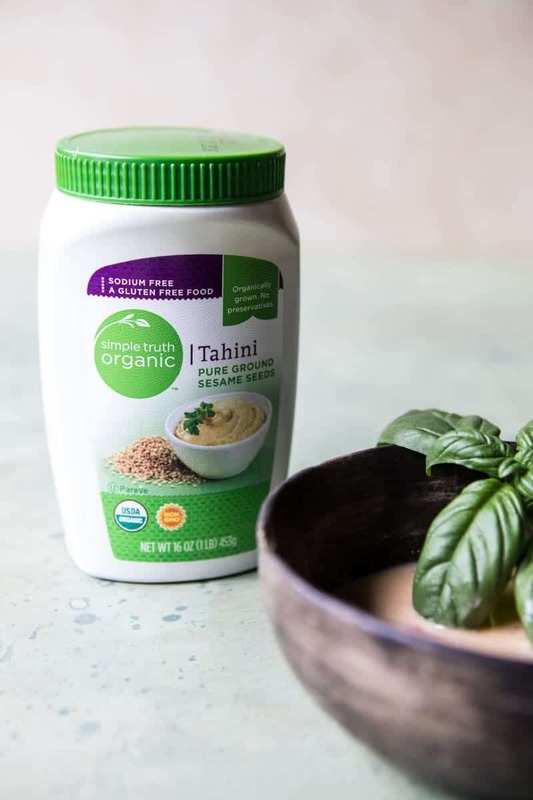 I love using Kroger’s Simple Truth, as their Tahini is organic and the only ingredient is toasted sesame seeds. It’s great for so many things, but I especially love using it to make hummus, dips, and sauces. I also often use tahini in place of mayo. Even though that may sound a little odd, it works so well. PS. Kroger is offering over $100 in organic digital coupons on their site Organics Everyday.com. <– my mom always taught me to love a good coupon. 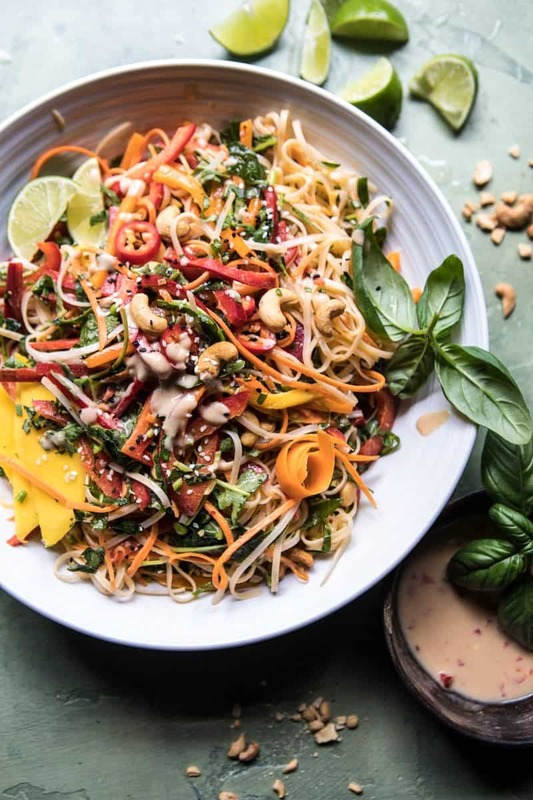 The salad itself is made up of rice noodles, tons of farmers market veggies, a mango for sweetness, a little sesame oil, and then topped with sesame seeds and cashews for crunch. Simple, pretty, healthy, and the perfect summertime salad. 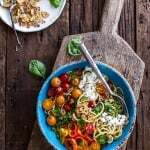 I love to make this salad on Sunday or Monday and then eat the leftovers for lunch throughout the week. I personally enjoy this salad best warm, but there are many in my family who prefer it cold. Either way, the noodles are so yummy. As I mentioned, I’ve been making this salad once a week for a few weeks now. It’s great to have in the fridge for an easy and healthy light meal or snack. I sometimes add hard-boiled or fried eggs to make the salad a bit hardier and add a little more protein…obviously this option is a very delicious way to go! 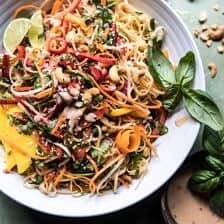 So what do you guys think of a noodle salad dinner tonight? It’s takes less than thirty minutes to throw together, is loaded with veggies and super pretty! Bonus that this salad is naturally gluten-free and vegan. <–love when that happens and I don’t even realize it until I write the post. 1. To make the vinaigrette, combine the tahini, honey, lime juice, lime zest, fish sauce, garlic, and ginger in a small mason jar. Seal the jar and shake until the vinaigrette is combined. 2. Cook the rice noodle according to package directions. Drain and rinse under cold water. 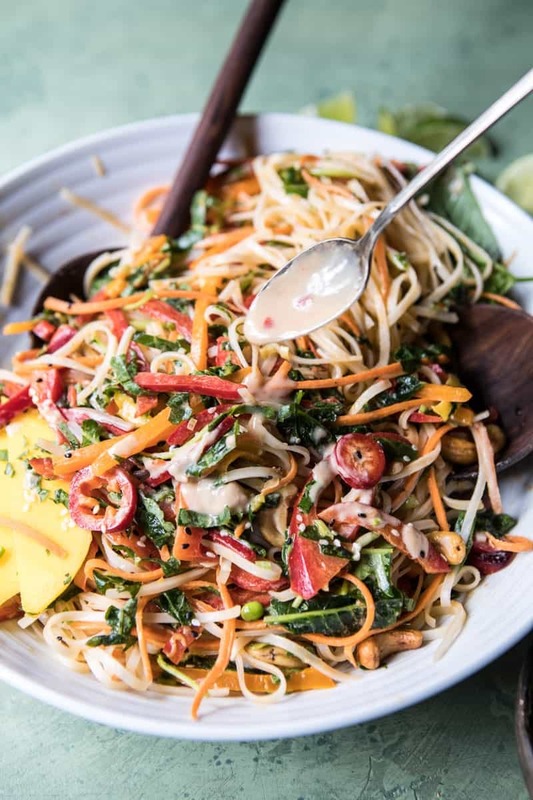 Add the noodles to a large salad bowl and toss together with the baby kale, edamame, carrots, bell peppers, lemongrass, green onions, herbs, and sesame seeds. Drizzle with the the vinaigrette and toss well to combine. Serve the salad warm or cold. This is a sponsored conversation written by me on behalf of Kroger. The opinions and text are all mine. 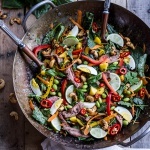 Thai Steak Salad w/Sweet + Spicy Tahini Dressing and Sesame Chili-Lime Cashews. Farmers Market Sesame Miso Noodle Bowls with Garlic Chips. 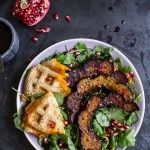 Miso Roasted Acorn Squash + Pomegranate Salad w/Waffled Cheddar Apple Tahini Toast. That’s a colorful and beautiful salad!!! How perfect! !Hope you love it Lisa! This looks beautiful! Looking forward to trying it. One note – you mention in the post that it’s vegan, but there is fish sauce in it so it’s definitely not vegan. Oh yes, I could eat this and be very very very happy!!! Thanks Ruth!!! Loving that your liking it! I love everything about this salad. Fish sauce and honey is not vegan, Tieghan. As my niece explains to my mother, no eyeballs granny. She does not eat anything with eyeballs. So happy you like it! Sorry about the vegan slip up! Always forgetting those two! Do you have any suggestions for a fish sauce subsistute? I’m allergic! Maybe miso? Hey Rose! You can just omit it and add a splash of soy sauce. that will be great. Let me know if you have other questions. Hope you love the salad! This sounds wonderful! The fish sauce is unique with the tahini, I look forward to sampling that. Nice salad and very colorful! Thank you Vicki! I really hope you like it! Thanks Matt! Definitely a favorite summer dish of mine! Asian noodle bowls are my fave! love this! One of my favorites too!! Thanks Alice hope you love them! You always have the most beautiful, colorful salads Tieghan! This one sounds delicious too. Love that sesame vinaigrette! Awh thank you so much Mary Ann! You always have the nicest things to say about my food, its the best! Made this last night! Delicious, but I beg to differ on the time for prep 😉 I think it took me closer to an hour than 20 minutes to prep all that! I’m sure you’re much more efficient than I am in the kitchen, however! Either way, it was delicious, and I chose to use peanut butter instead of tahini (had to throw out my very old tahini) and of course the peanut taste married very well too! Sorry about the prep time! Sometimes its hard to say how long it will take! So happy you liked it though! Thanks Linda! This looks great! I picked up the ingredients today and plan on making it tomorrow night. I have one question: “3/4 cup basil, and cilantro”. How much cilantro? 3/4 cup of each? A combination? Or should it say “3/4 cup basil, *or* cilantro”. Thank you for so many wonderful meals. So glad to have found you! It’s 3/4 cup each cilantro and basil, but use what you feel your taste buds will enjoy! Let me know if you have any other questions. Hope you love the salad! So gorgeous, I love all the colors and textures! What a gorgeous bowl of deliciousness! So excited to make this! In the blog post, you mention that you used a Fresno chile pepper in the sauce, but I didn’t see it in the ingredient list. Do you use the entire pepper? Hi! I only used a fresno to add to the top of the salad. So sorry if that was confusing. Let me know if you have questions. Hope you love the salad! I made this last night —it was SO fantastic! In fact it was so good I am having it for late lunch/early supper right now. This is great warm or cold. I bet it would be good with grilled chicken or shrimp as well. I still wasn’t sure on the amount of basil/cilantro, so I used 3/4 cup of basil and 1/2 a cup of cilantro. What do you intend? I also see someone asked about the pepper, which wondered about last night. For next time (there will be LOTS of next times! ), how much Fresno pepper? Thank you again for your wonderful recipes and mouth-watering photos. I try something new from your blog at least once a week & we’ve always been thrilled! Tahini does wonders! And I actually have that EXACT one sitting in my pantry. I LOVE using it as a sauce for noodles. This recipe is SOOOOOO gonna happen! Wow this was one of my favorites. I packed the leftovers for lunch and am ALREADY thinking about it (it’s 10am!) Not to mention this was so beautiful and colorful… I couldn’t get enough. Thank you Libby! I am thrilled you loved this! I made this last night, it was so much tastier than I expected, especially the vinaigrette! I’ve been reading the blog regularly for a few months, but this is the first thing I’ve made; it turned out so well I’ll definitely be trying lots more of your recipes – thank you! SO happy this was the first one you made! Thanks so much! Just made this – so delicious! How long does the salad keep in the fridge? And would you recommend storing it with the dressing mixed in or separate? Absolutely amazing! So so delicious! And altho I did put fish sauce in it (I’m vegetarian but was having company and wanted it to be perfect! ), in the future I would feel fine about omitting it. Company – our family night – all loved it! I am following you on Instagram, and finally decided to look up your blog…. I’m so excited! Can’t wait to try more of your recipes! SO happy you liked it and omitting would be perfectly okay! So happy you came to the blog!! Thank you Cathy! I have been followig you for some long. I just love your recipes. Here in Brazil, I make succsess with your recipes, but have to make some substitution once we don’t have the same igredients as you. I am so glad you make my recipes and enjoy them! Thank you!